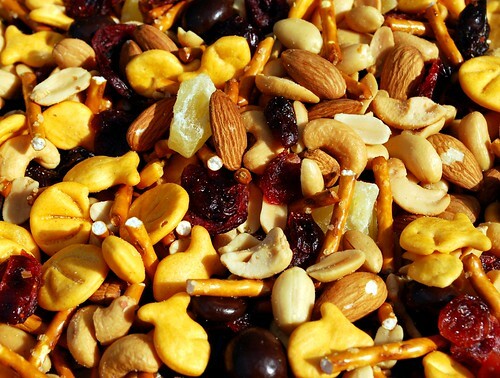 The key to the perfect trail mix is to hit that ration of sweet-n-savory right on the nose. 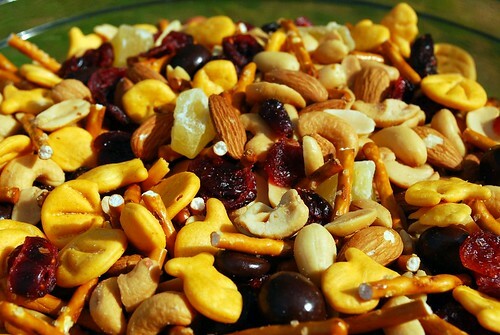 Here, the sweet tartness of dried fruits and chocolate compliments the salty pretzels, nuts, and goldfish. The combination of textures and flavors is so satisfying – perfect for an extra energy boost on the run. Trail mix is delightful as an afternoon snack, as a fun party snack, or for its intended purpose – to take on the trail! Mix all ingredients in a large bowl until evenly combined. Package in indivivdual servings, if desired. Enjoy!